Features a moveable grading blade! 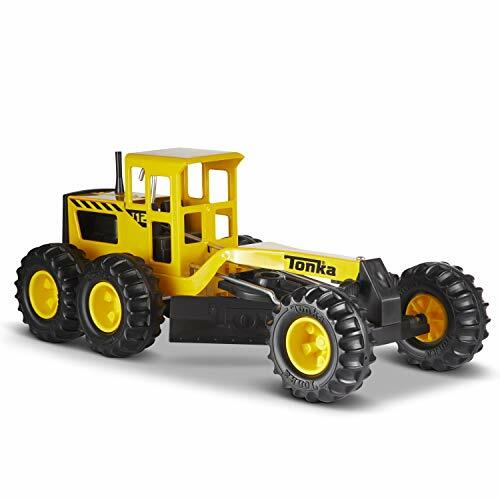 Level dirt and gravel like a pro with the Tonka Steel Road Grader! Move the blade side to side to flatten anything in its path; no material is too tough for this Tonka vehicle to handle. Made Tonka Tough and built to last with a Lifetime Guarantee! Grandson especially enjoys the possibilities of changing grading depths and angles as well as the steerable front wheels. Planning for a summer sand box is underway to provide actual movement of material. Not the Tonka I had as a child, but it is still TONKA tuff!! And our grandson loves it and it should last him a life time. It had too much plastic on it. Wasn’t what I thought it would be. I thought I had bought an all metal toy.